Pet CPR and First Aid – Would You Know What to Do? If your pet was injured and in distress would you know how to deliver first aid and/or CPR (cardio pulmonary resuscitation)? Last weekend, I attended a workshop entitled “E7 Palozza” at That’s My Dog!, a superb dog training facility in Dubuque, Iowa. One of the presenters was Sharon Lawson, a certified PetTech Instructor. She provided an excellent training course for the professional dog trainers in attendance about CPR, First Aid and Care for Your Pets. 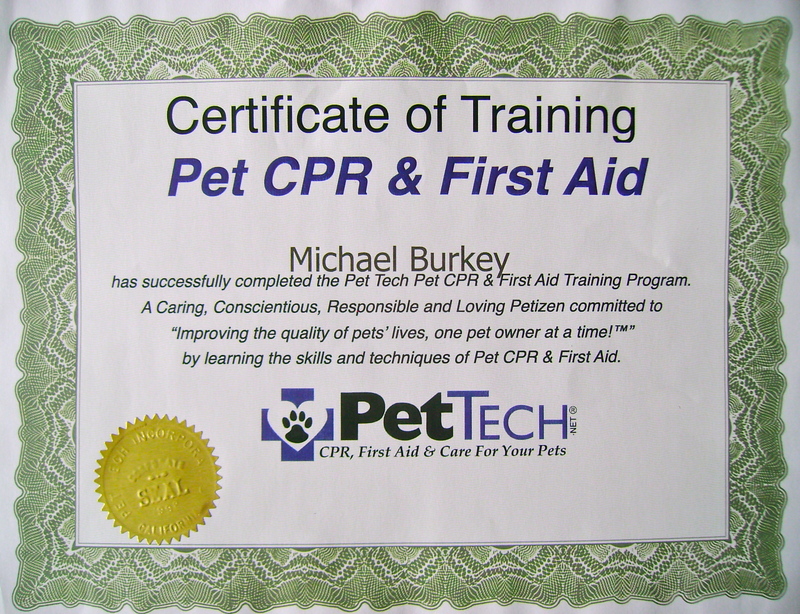 Although, I have been certified in CPR and Advanced First Aid for humans, attended previous first aid classes for dogs, and been around dogs for most of my life; the PetTech class was enlightening. I would recommend a similar class for anyone with a pet. It was very educational and the learning was made fun via the use of simulated dogs to practice rescue breathing and CPR. You never know when one of your pets or a friend’s pet will become injured or distressed. And, the immediate care you give may increase your pet’s chances of surviving before receiving veterinary care. For a PetTech class in the Canton, Michigan area; contact Roberta Chapman of First Aid 4 Paws. She is a certified PetTech Instructor and prior Veterinary Technician. This entry was posted in Health and tagged Animal, Canton, Cardiopulmonary resuscitation, dog, Dubuque, First aid, Iowa, Michigan, Pet, PetTech, professional dog trainer, professional dog trainers, Roberta Chapman, Sharon Larson, That's My Dog, Veterinary medicine. Bookmark the permalink. 1 Response to Pet CPR and First Aid – Would You Know What to Do? This is a really great idea! 😀 I am working so hard to get people here in Iowa educated on the importance of treating animals humanely. Keep up the amazing work!